Bloggers know this, sometimes it’s hard to talk about things you love. Too often you get wrapped up in reviewing everything at the risk of running out of content that you don’t appreciate the content you ingest. And then there are the moments where you remember why you love classic film. As the film fan becomes more discerning, it’s often hard for us to get excited, truly excited, about watching movies, whether that’s because we’re just stressed from the day or feel we’ve seen it all. It’s like growing out of Christmas. You remember how excited you were as a kid anticipating the holidays, and you’d give anything to feel that way again? Sometimes though, you do. This is really just my long-winded way of explaining my newfound love for Esther Williams. 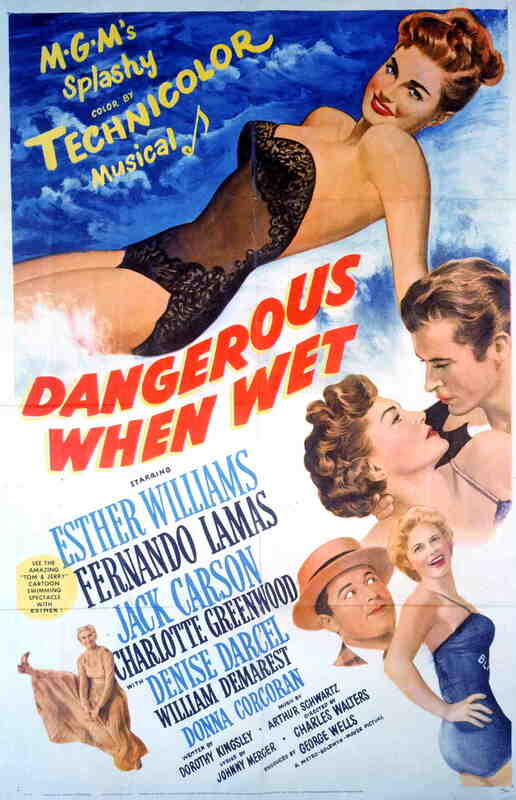 I don’t get to just watch TCM as much as I used to, but on a whim I decided to watch my first Esther Williams film, Dangerous When Wet. A star whose persona and talents were swimming had to yield a short shelf life and even worse movies, right? I mean, only during the studio era could this be marketed as reasons for A-list stardom. Katie Higgins (Williams) would rather learn about farming, unlike her severely athletic family. When salesman Windy Weebe (Jack Carson) arrives to town selling a tonic called “Liquapep,” he thinks the Higgins family would be perfect spokespersons. He enlists them in swimming the English Channel as the “Liquapep family,” but when Katie turns out to be the strongest one in the group, it’s all up to her. In her autobiography, Esther Williams says her film plots were rather generic. (I’m paraphrasing but I believe she said she played a character named Katie, with similar sounding last names, more than once.) Dangerous When Wet is pure escapism and it’s hard finding the escape in most movies without losing something in the entertainment, but the film accomplishes both tasks. The entire Higgins family is introduced through a humorous song, “I Got Out of Bed on the Right Side,” one of the catchiest movie tunes I’ve heard. I originally saw this three months ago and I still find myself singing this when I wake up in the morning. Like the best musical moments it explains what we need to know about the characters. The group troupes out in a line, prepped for their exercises while Williams’ Katie blindly walks behind them reading a book. In fact, Katie’s complete antipathy for swimming seems to poke fun at Williams’ persona. When the Higgins’ are recruited to swim the English Channel the plot goes from bouncy fish out of water story to bouncy fish in the water. Esther Williams is beautiful, of that there’s no doubt, but what shines through is her energy. Katie is determined and ambitious, but never willing to step on others to further either element. 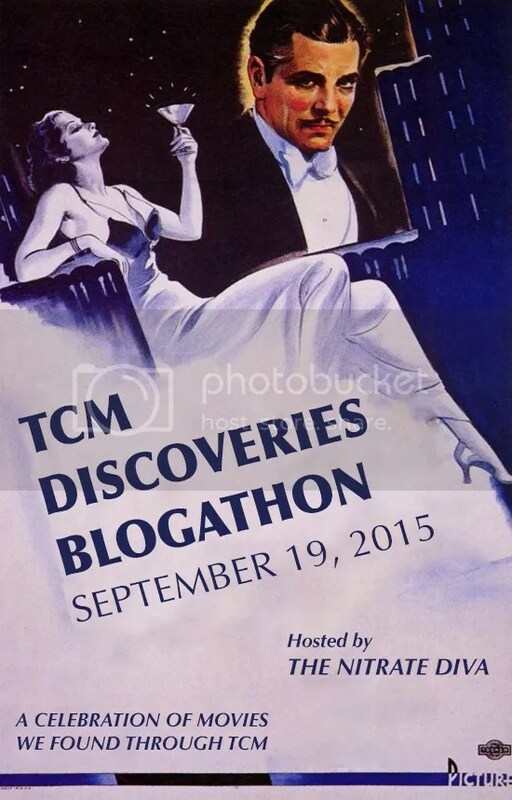 The films doesn’t have the grandiose theatrical swimming scenes Williams became famous for in the likes of Bathing Beauty (1944) or Million Dollar Mermaid (1952), which lends an authentic mien to proceedings. The swimming of the Channel itself is riveting, if only because of how authentic it feels (despite probably being filmed in a backlot water tank). A montage shows the strength training that takes place to do endurance events like this, and in the finale you are left wondering if she’ll make it. Jack Carson as Windy, William Demerest as Pa, and Charlotte Greenwood as Ma are great, but it’s hard taking your eyes off Williams and her soon-to-be husband, Fernando Lamas. The opening indicates an attraction between Windy and Katie that’s one-sided on his part. When Williams runs into Lamas’ Andre, the sparks start flying – and it’s not surprising that, 16 years later, they’d marry. Originally conceived for Williams’ previous co-star, Ricardo Montalban, Lamas was also a world-renowned swimmer and that makes his swims with Williams take on an additional romantic air. The chemistry between these two is clear, and the film’s best scenes involve them together. I’d be remiss in not mentioning Williams’ famous swim with Tom and Jerry. Boy, those two got around, swimming with her and dancing with Gene Kelly! Before the big swim Katie ends up having an extended dream sequence of swimming with the dynamic duo complete with a Lamas-like octopus (subtle!). This is the perfect blend of cartoon and live action, 35 years before Who Framed Roger Rabbit would be considered the benchmark. Williams seamlessly appears as if she’s inhabiting the same space as the cat and mouse pair. Dangerous When Wet didn’t turn the world on its ear, but it sealed my adoration for Williams! I also have to give a shout-out to director Charles Walters. I loved the recent biography out about him, and this proved that he’s an unsung director worth singing about! Yay, Michaela, we need to start an Esther fan club or something! I have Thrill of a Romance taped, so once I get to it I’ll be sure to hit you up to talk it over! Your review certainly enticed me to watch it. Please do! I could chat about Esther all day! What a lovely catchy tune! I think some Esther Williams’ films are rather “meh”, but others balance entertainment and escapism perfectly, without being dull, like Thrill of a Romance and The million dollar mermaid. Great review, now I want to see this film in a hot lazy afternoon! Thanks for stopping by Le, and I still have a few Esther films to watch – namely Thrill of a Romance and Million Dollar Mermaid. I can’t put my finger on why I love her, but her movies are just joyful to me.